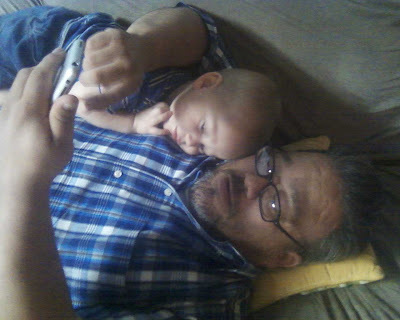 Here is Joshie laying on Daddy's chest during our evening Bible time. We read about Noah, and Joshie usually listens attentively, especially if we quietly narrate into his ear as we listen. Of course, he doesn't grasp all of what we can, but he is making progress. It is amazing what little children can retain and we just wish we would have realized this sooner! One of our older kids has resolved that if they have a child someday, they will read to him or her the Bible daily, from their first day!